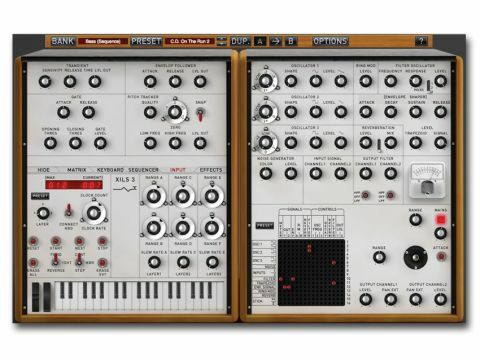 XILS 3 is a brilliant synth that also fills a VCS3-shaped hole in the market. Great work, XILS-lab! Magnificent matrix modulation. Super sequencer. Unusual trapezoid envelope shaper... ...and an ADSR for the rest of us. Excellent preset collection. Ideal for far-out effects. Matrix can be a bit fiddly. There's no denying that this cross-platform, VST, RTAS and AU instrument from XILS-lab bears a resemblance to the ancient - and rather quirky - EMS VCS3, which was a hardware synth popularised by big names like Pink Floyd, The Who and Hawkwind. In fact, the synthesis controls that take up the right half of the GUI are nearly bang-on identical, and a trip through the presets drives the similarity home with some sequences that recreate Pink Floyd's EMS masterpiece On the Run. However, XILS-lab claims that its instrument leverages the best aspects of the VCS3's semi-modular design to create a thoroughly new synth with its own character. And the company has accomplished this well, although XILS 3 is, indeed, also capable of recreating the most famous EMS sounds. Like the VCS3, XILS 3 sports three oscillators with a pair of waveforms, a Shape control and level knobs for each wave. Oscillator 1 offers sine and saw, while oscillators 2 and 3 have square and triangle onboard. There's also a noise generator with Level and Color parameters. Timbral shaping is provided by a resonant filter with 2- and 4-pole low-pass modes, the latter of which is capable of self-oscillation. There's a switch position reserved for a 3-pole filter mode that will be added with an update - this will bring the instrument even closer to the VCS3. Ring modulation is here, too, as is a simple spring reverb, and these are parts of the synthesis architecture itself - ie, they're separate to the chorus and delay found in the Effects section. This is an important point, as it means the ring mod and spring reverb can be placed anywhere in the signal path via the mod matrix, on which more later. VCS3 maniacs will be pleased with the inclusion of the rather befuddling 'trapezoid' envelope generator that was unique to EMS in its day and still leaves even seasoned synthesists scratching their heads. Like the original, it has four parameters: Attack, On, Decay and Off. With the Off knob fully clockwise, the envelope functions as normal, but in any other position, it switches into looping mode and controls the length of that loop. "VCS3 maniacs will be pleased with the inclusion of the rather befuddling 'trapezoid' envelope generator that was unique to EMS." This has always been a powerful modulation tool for EMS users and bolsters its reputation as a source of special effects. If you can't get on with the trapezoid system, however, XILS-lab has thoughtfully included a regular ADSR envelope, too, which is activated by clicking the envelope panel's header. The left-hand cabinet is dedicated primarily to the sequencer controls. Modelled on EMS' famous 256-step digital sequencer (erroneously dubbed an "analogue-style sequencer" in the XILS 3 manual), this 128-event, three-track sequencer can be routed to six outputs, which, in turn, can be patched to a vast selection of destinations. The sequencer can be clocked to the host or left to run on its own. Thankfully, notes can be entered from your MIDI keyboard in a step-entry fashion, too. The VCS3 offered audio inputs - which were most famously put to good use by The Who - and XILS 3 follows suit. A separate effects version appears in your plug-ins folder and it offers everything that the regular instrument does. In yet another tip of the hat to EMS, XILS-lab has provided a neat pitch-tracker that detects the frequency of incoming audio and applies it as a modulation source - we had a great time throwing different a cappella vocal clips at it and using them to control oscillator pitch, filter frequency and more. Transient detection is offered as well, so that incoming audio can also trigger the synth. You may have noticed the pin matrix at the bottom of the synth section, which appeared on the original EMS instruments as a clean and flexible alternative to patch cables. Presented as a grid, the user may connect any of the 16 sources (vertical axis) to any of 16 destinations (horizontal) by inserting a pin at their intersection - this is not only for shaping sounds but is necessary to get any sound at all. Wisely, XILS-lab's matrix takes after the initial VCS3, with outputs for each oscillator's wave. This is a nice touch, since it means you can set up a patch wherein Oscillator 1's sawtooth is sent to the filter, while its sine wave is routed to the ring modulator. XILS-lab ups the ante with a further three matrices, all found at the top left of the GUI. The smallest (4x6) routes incoming trigger signals to the trapezoid envelope generator or various other sequencer functions, while the sequencer outputs have a matrix (6x11) that can be used to modulate synthesis parameters, such as pulse width, oscillator frequency and filter. "Presented as a grid, the user may connect any of the 16 sources (vertical axis) to any of 16 destinations (horizontal) by inserting a pin at their intersection." Finally, there's an 11x10 matrix with additional synthesis modulation possibilities, sharing the same destinations as the sequencer matrix. As you'll appreciate, this all makes for ridiculous flexibility. One of the great joys of the EMS instruments comes from shoving pins into the matrix willy-nilly just to see what happens. XILS 3's matrices are not without their problems, however, as while there are mouse-over crosshairs to make your patching clearer, it's all too easy to hit the wrong spot due to the small size of the matrix area. Additionally, the VCS3 could accept pins of different resistances, so that you could alter the modulation amount - it would have been great to have that level of control implemented here. There's more to XILS 3 than we can possibly cover here, but we'd like to make special mention of the factory patches. They are, almost entirely without exception, beautifully crafted and cover a wide range of genres and needs, plus the patch designers have whipped up an impressive selection of thick, juicy basses and evocative leads, as well as some exquisite pads, sequences and FX. Nice work. In summation, XILS-labs has come charging out of the gate with an absolute winner, for XILS 3 is a terrific synthesizer that sounds gorgeous and is great fun to program. Sure it is, at its very core, yet another virtual analogue entering a saturated market, but like the instruments that inspired it, it presents familiar tools in an intriguing way, which begs the synthesist to dive right in and get their hands dirty. It isn't for everyone and it might leave greener synthesists perplexed, but it offers inspiration, especially for those who think they've heard enough analogue synthesis to last a lifetime. XILS-lab is going to have a tough time topping this one!